!!!!! CLEANS CONCRETE FLOORS VERY WELL !!!!! 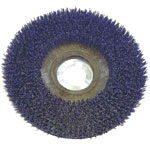 * Please call us with any questions about our brush strata grit for 17 inch in South Chicago Heights IL and Highland IN.